As you can see from the list above, the HotDoodle generated buttons are nore powerful. See Add a PayPal Block. The PayPal block does, however, require a dynamic price plan. 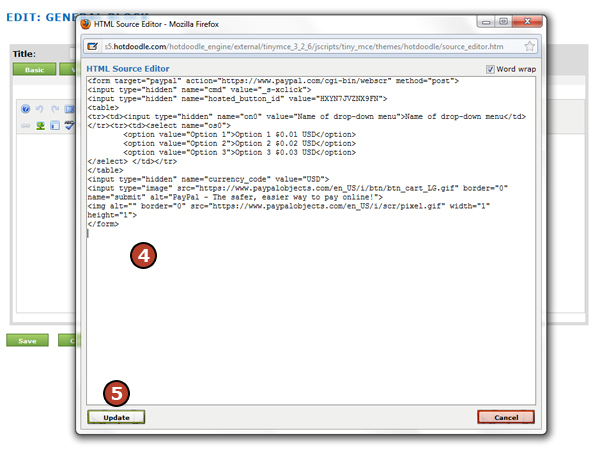 The HTML code from the PayPal button generator is safe and is allowed by the HotDoodle text editors, but you have to enter raw HTML edit mode to enter it. There is no charge from HotDoodle for using these buttons. Alternatively, the HotDoodle PayPal block can accept the HTML generated by PayPal and, in some cases, can track the activities. 2. Click on the "Merchant Services" Tab at the top of the screen. 3. Click the "Buy Now Button" link under the Buy Now Button icon. 4. Select a button type from the drop down menu. 5. Add the details of the product to generate the embed code for. 6. Click "Create Button" at the bottom of the form. 7. The embed code will appear in a window, click on the "Select Code" button. 8. Copy the code to paste into HotDoodle. 3. In the text editor, click on the "HTML" icon, it is on the bottom row all the way on the right. 4. Click the cursor in the HTML source editor screen and paste the copied PayPal embed code. The HTML code will display a PayPal graphic on the website that is connected to the PayPal account it was generated in. 5. Click on the "Update" button at the bottom of the HTML Source Editor screen. 6. 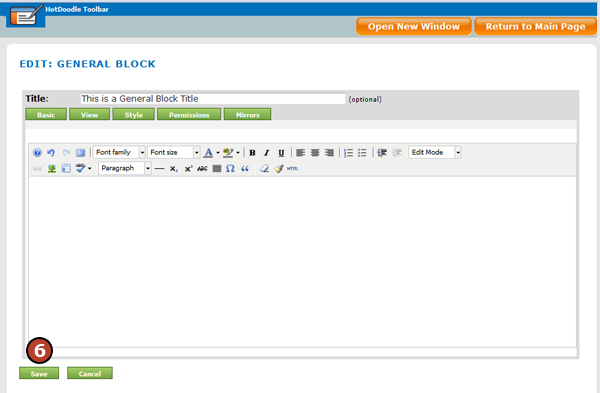 The image of the PayPal button will display in the text editor, click on the "Save" button. 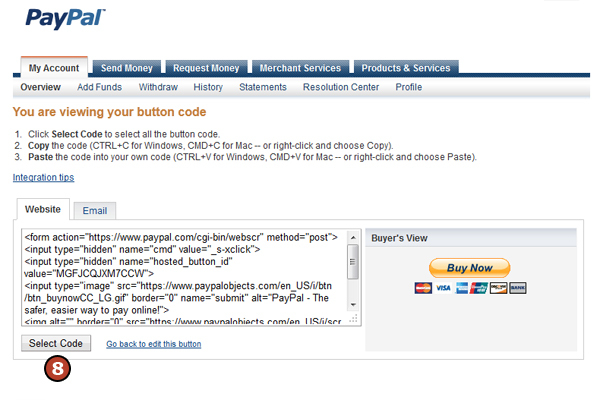 The PayPal button graphic will display on your web page and will be linked to the PayPal account. Changes are complicated when using PayPal generated buttons as you have to go to PayPal, make the change, and re-embed the altered button code. 2. Click on the "Merchant Services" Tab. 3. Under Create Buttons heading, click on the "My Saved Buttons" link to see a list of existing buttons for the account. 4. Locate the button to make changes to and click on the "Action" drop down to the right. 5. 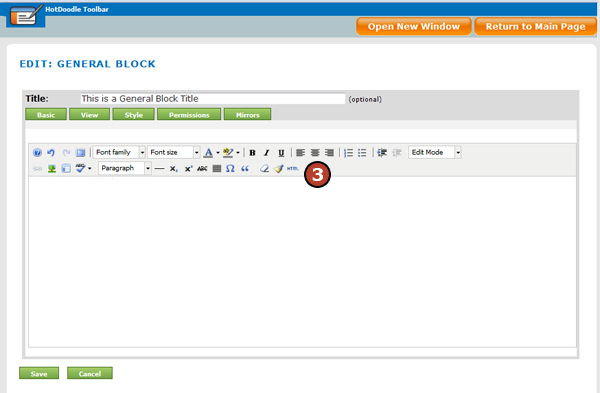 Select "Edit Button" from the drop down list and click on it. 6. Make changes as necessary on the form. 7. Click on the "Update Changes" button. PayPal will generate an updated embed code. 8. Click on the "Select Code" button and copy this embed code to paste over the previous embed code for that product at HotDoodle. To be able to update price and make product detail changes right on HotDoodle without having to make the changes at PayPal too, upgrade to the Dynamic Hosting plan at HotDoodle and use the PayPal Identity Token to link HotDoodle to PayPal instead of the embed code way of linking. With the PayPal Identity Token on a HotDoodle website, HotDoodle will tell PayPal the prices to charge instead of the ther way around with the PayPal embed code.